1. Install new compression and fire rings (5). Ensure the piston ring grooves are clean and free of debris. Do not expand rings more than necessary or damage to equipment may occur. 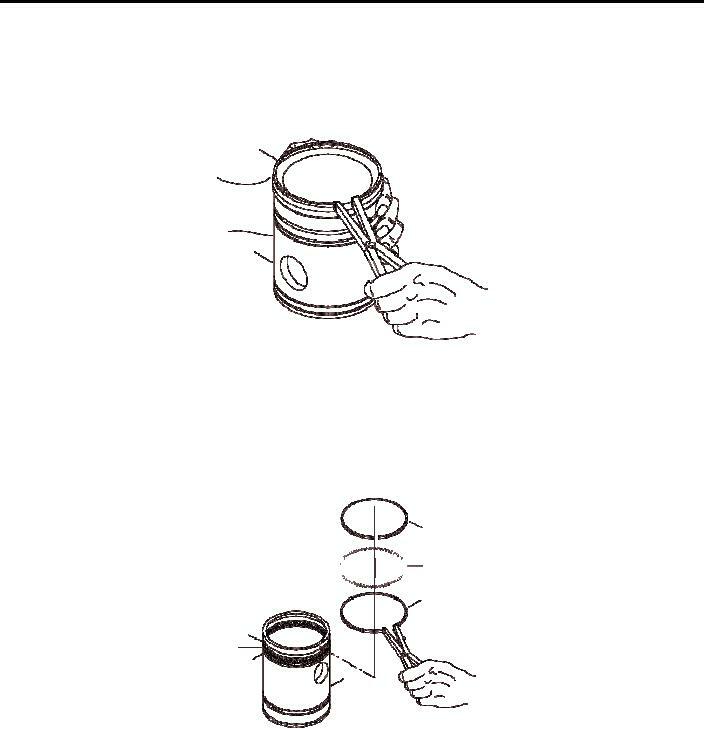 Using the tool, expand one of the compression and fire rings (5). Start with the bottom compression and fire ring (5) and work up to the top. Stagger the end gaps so they are at 0°, 120° and 240°. Install new oil control rings (3 and 4). a. Using tool, install expander ring (4) in piston (1). Install top oil control ring (3) in the top of the oil ring groove above the oil ring expander (4). Rotate oil control ring (3) end gap 180° from expander (4) end gap. d. Install lower oil control ring (3) below the oil ring expander (4) in the bottom of the oil ring groove. Rotate oil control ring (3) end gap 90° from expander (4) end gap. Follow the same procedure for the second set of oil control rings.